Donemana skipper Ricky Lee Dougherty dedicated their fifth North West Senior Cup win in a row to the hugely popular Ken Kerrigan, who had passed away earlier this year. The wicket-keeper, who played his part in their victory over Coleraine on Saturday, feels the community spirit in the area makes them a special club. “We have a great young team, who work so hard and this year has been one of the hardest working seasons we have ever put it,” he insisted. “Over the years we have kind of relied on our talent but we really do want to push on for the league now. “Normally after the Senior Cup, it’s a kind of put your feet up now and relax for the remainder of the season, but this year we want to push on and try to win the league. The ex-Institute striker concedes that while there are a number of young players in the squad, some of them already have had played and more importantly won five Senior Cup finals. Dougherty, like everyone in the dressing room, is already setting his sights on Clooney’s 110-year record of six Senior Cups in a row. “Next year we’ll get our heads down again in terms of trying to win the senior cup,” he added. “Yes we have a very young team, but it’s a very, very experienced team, because there are guys in the dressing room who are 20 years-old and have won the senior cup five times. Normally after the Senior Cup, it’s a kind of put your feet up now and relax for the remainder of the season, but this year we want to push on and try to win the league. “There’s guys who will play senior cricket throughout their whole career and they’ll never get to a final. “So yes it’s a very young dressing room, but it’s still a very experienced dressing room in terms of playing back matches and big cup finals. At the start of the season Ireland international Andy McBrine was believed to have turned down a big move to NCU kingpins CIYMS. While the McClintock twins Gary and William were also rumoured to be leaving the club, but all three remained, however that speculation will continue. Nevertheless Dougherty is confident that the team spirit and togetherness will ensure they remain at the Holm for a few more seasons and if they do stay put then success is sure to continue for the County Tyrone men. 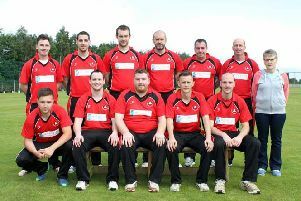 “There are always teams from the outside looking in at Donemana Cricket Club,” he added. “But it’s different at Donemana, you could see there’s a lot of heart in the side, we are all playing for our community, playing for the fans, our families and friends.